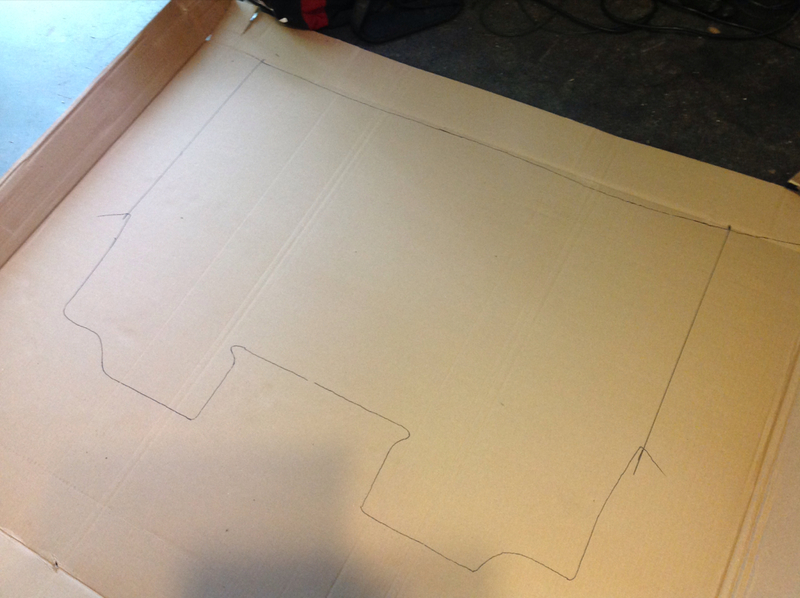 First I started out by tracing my rug onto a large piece of cardboard. Make sure you mark whee the flaps fold up. 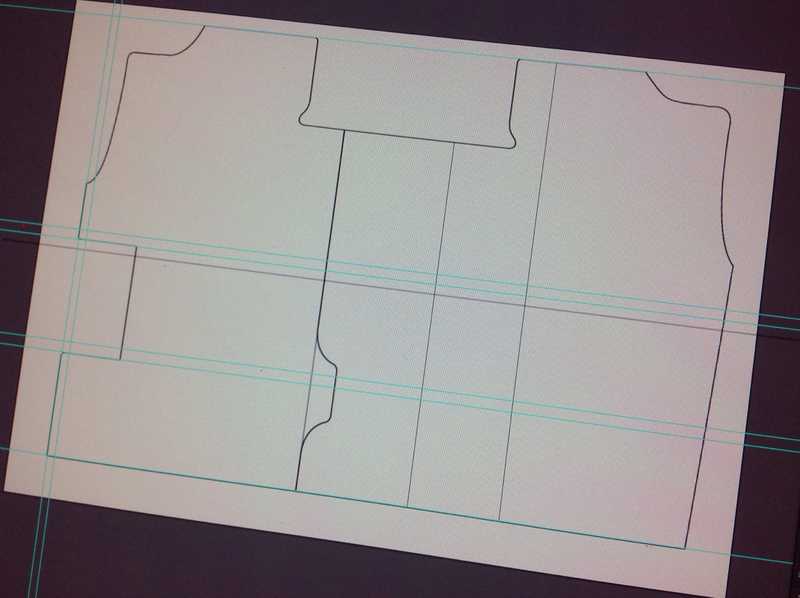 Here we have the basic outline. 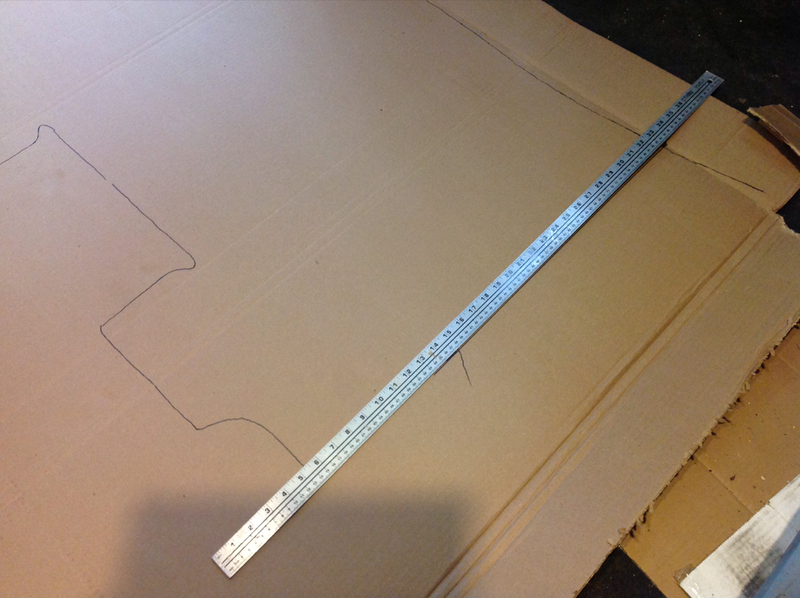 I used the marks from the fold marks and connected them using a yard stick. 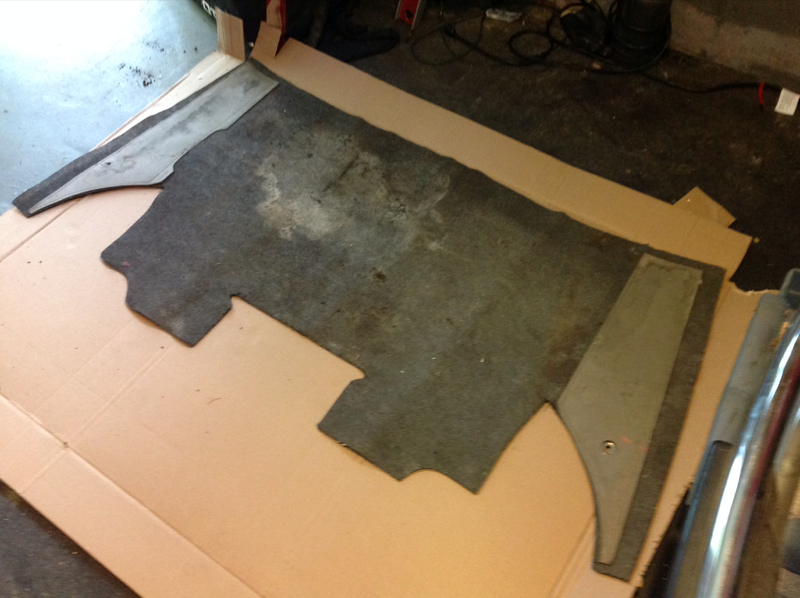 Once the basic outline was in place I cut out the template in preparation for trunk fitting. 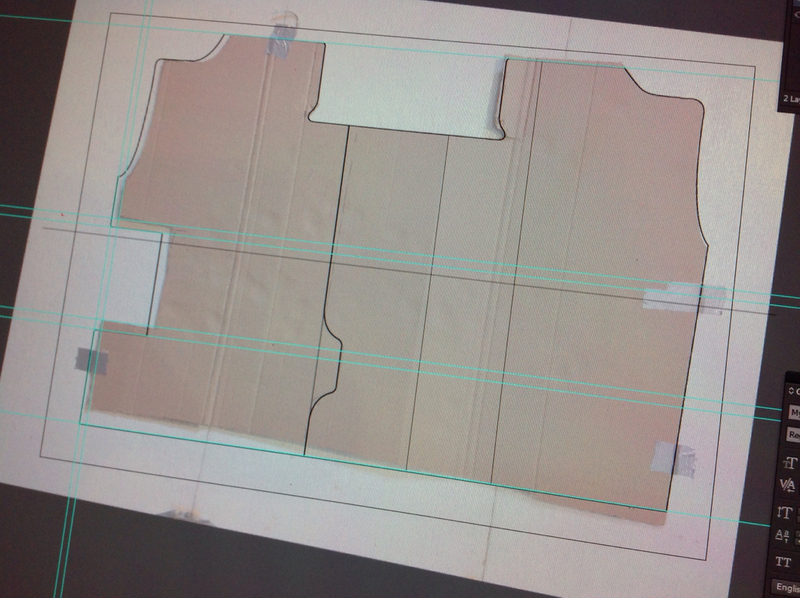 I did some test fitting and adjusted some of the template lines. 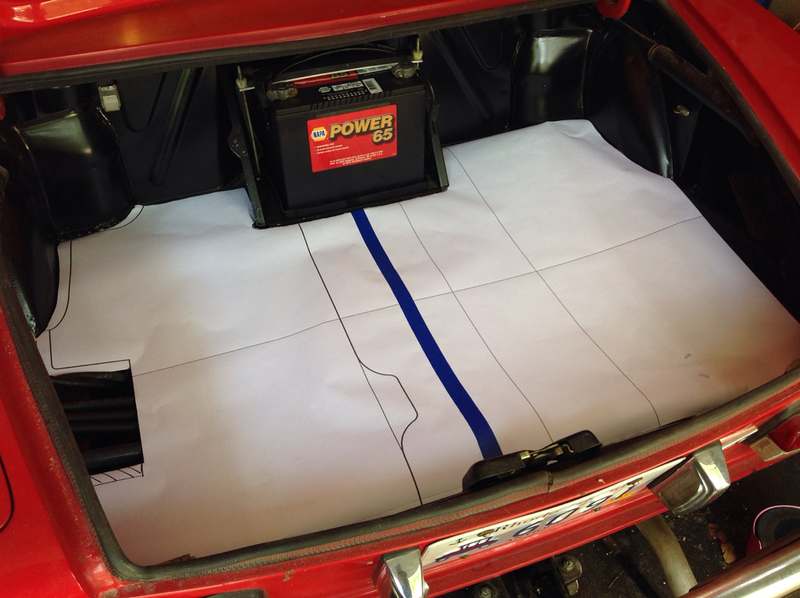 The template should fit most Fiat Spiders. I have a Fiat Spider 2000 and I'm not sure how the earlier models differed, if at all. 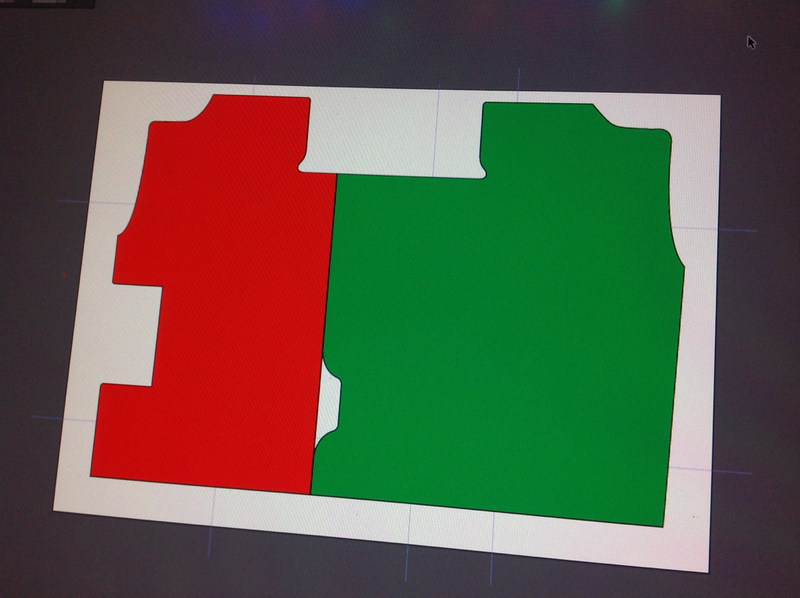 After taking a digital photo of my template I was able to import it into a graphics program. I used the program to outline the template as best as possible. Here is the cleaned up file ready for print. 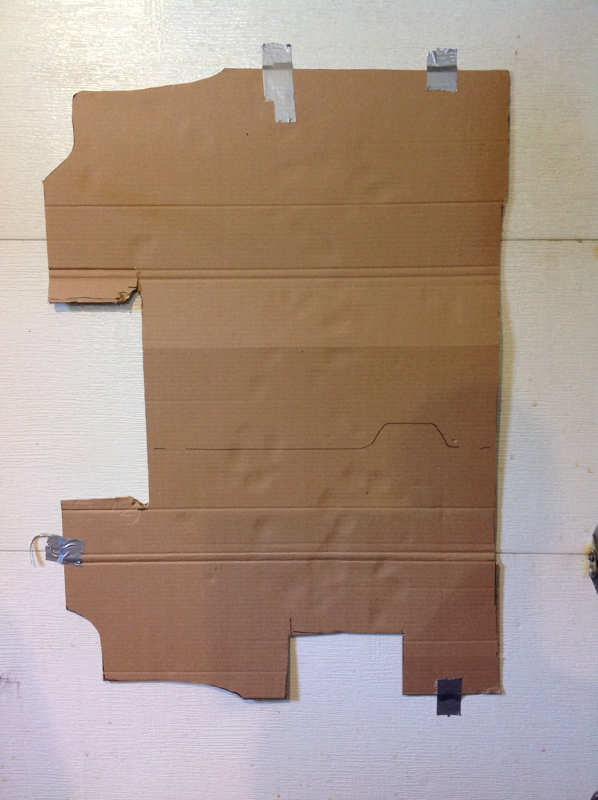 I printed out the template in two pieces on my large format printer. I had to do some tweaking and then fix some issues in the template computer file. 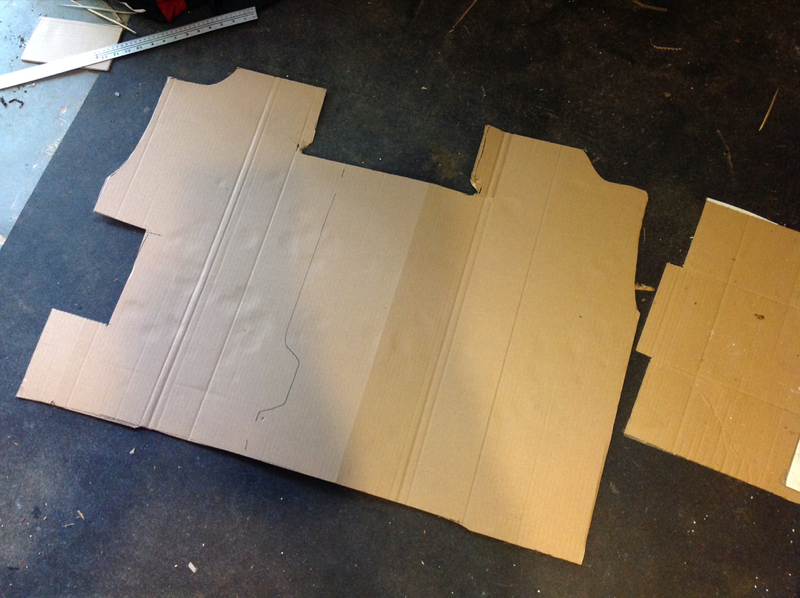 Here is a comparison between the original template (that brown board on the right) and the template I made. 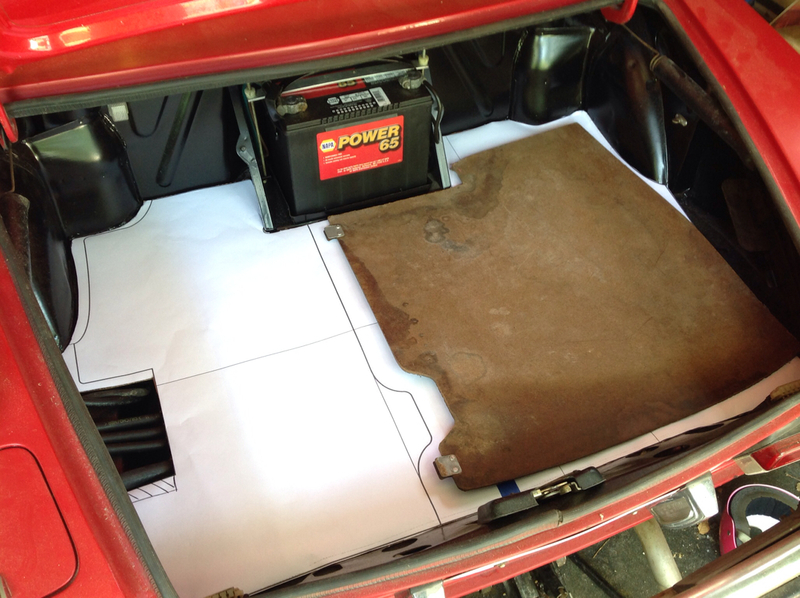 As you can see, the original boards only covered up the spare tire hole. This template gives more coverage and should allow people to make themselves a nice upholstered bottom board or rest their factory run on top. The final file with all the tweaking will be available for download. I'm sorry I do not have templates for the "wings." I had no need for those. At a later date I may make a set, just so I can post some download files. When the files are ready you will see a "downloads" in the right blog column. Hope they help. I totally forgot that I received this for Christmas. 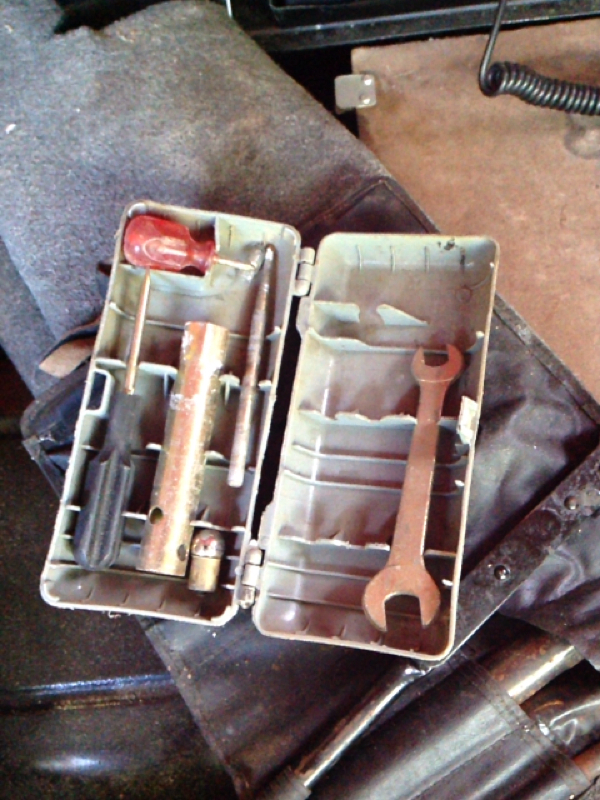 This is the original toolkit thy came stock with the car. I also received the original jack and jack wrench. I will need to research how they install. I do not have the original rubber strap for the jack. More tools received from Christmas. 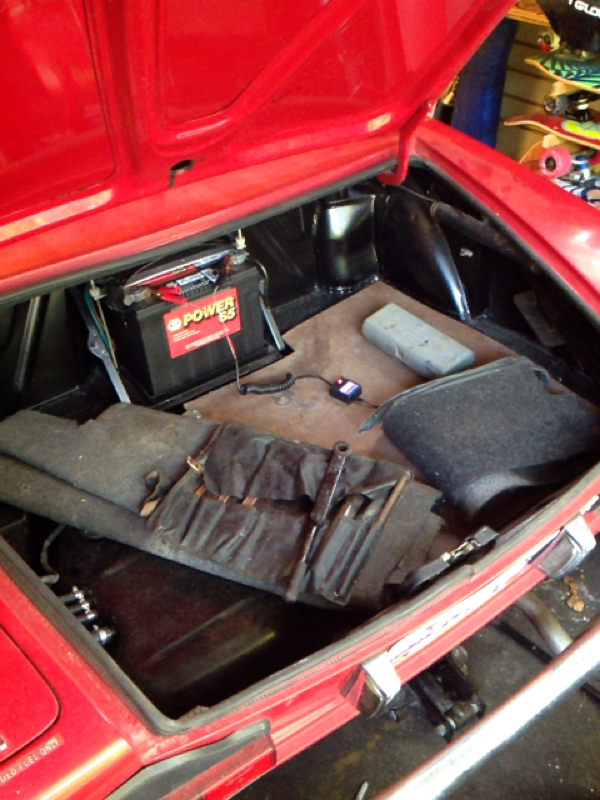 While I&apos;m waiting I plan on finally fixing up the trunk. I have one wooden side, the bottom rug and back rug. I&apos;m not thrilled with the fit do the stock wood that I have so I think I will make a full custom floor panel, split in two like the original. If it goes well I will make a digital file for folks to print out. I was able to find some hoses to put on the car this week. I went down to the local mom and pop parts store and we scrounged around. 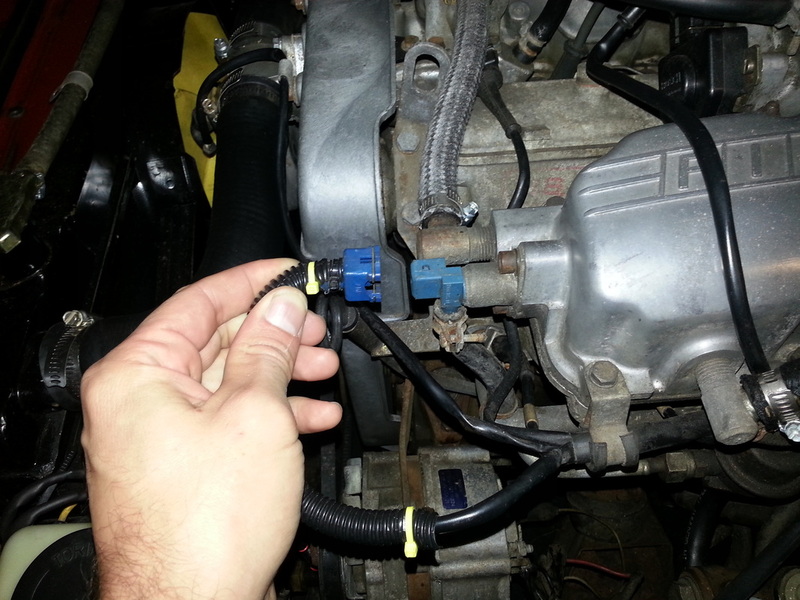 They ended up ordering me a flex hose with wire in it for the bottom hose. This should keep it from collapsing in the future. I also may have found the culprit for the collapsing. 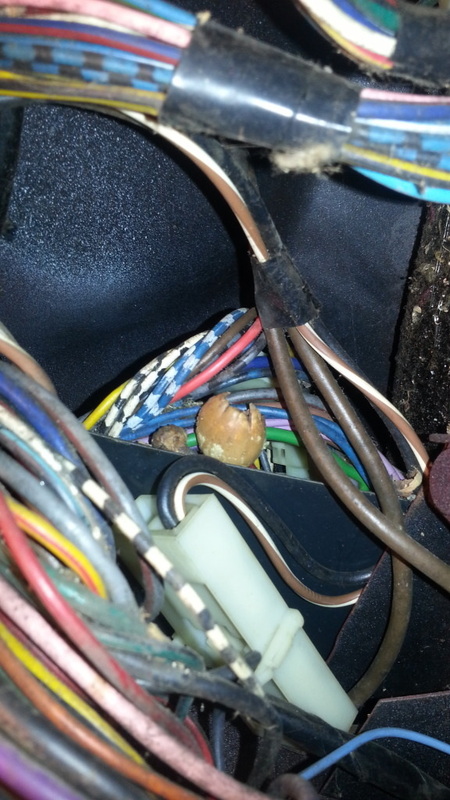 Not only were my hoses pretty worn, but there was an acorn on the top side of my thermostat. Hopefully there aren't more. If you followed this thread from the beginning, you know I really had my work cut out for me. I had a pile of 'constant torque' hose clamps from the PO (aka UNCLE) and I need three more to finish up my hoses, then I filler her up and burp her again. I hope to order some shocks for the rear on Thursday and see how that helps out the ride. One is seized, as many of you already know. After that is all said and done, I have a bunch of work to do on my daily drivers and then hopefully I scrape some money away for some front end work. Not much has happened for my Spider in the past year or so. Funds have been short and there are issues I'd like to resolve with the car before returning it to the road. One of my biggest problems with the car right now is the suspension. On of the rear struts seems to be ceased. All of the corners of the car bounce freely with the exception of the rear passenger side. This leaves me with two options. I can compress all the springs and replace the struts or I can replace the springs and struts at the same time. Unfortunately this opens up even more possible problems. Do my A-arms need to be rebuilt? After taking off the springs, will I want to put them back on withour replacing other parts that require the springs removed. Another thing I am considering is how these alterations will effect ride height. Do I really care how high the car sits? Not particularly, but this model year and beyond were raised in the US to meet DOT standards. So, a slightly lower ride will probably have a nice feel and be more visually appealing. I prefer to do that without cutting. Currently, my immediate plan is to try and save enough money to take care of the springs and shocks. Possibly just the shocks. We'll see what the plan ends up requiring. I decided to take the Fiat out for a drive today. I tend to warm the car up because the cold start doesn't work. 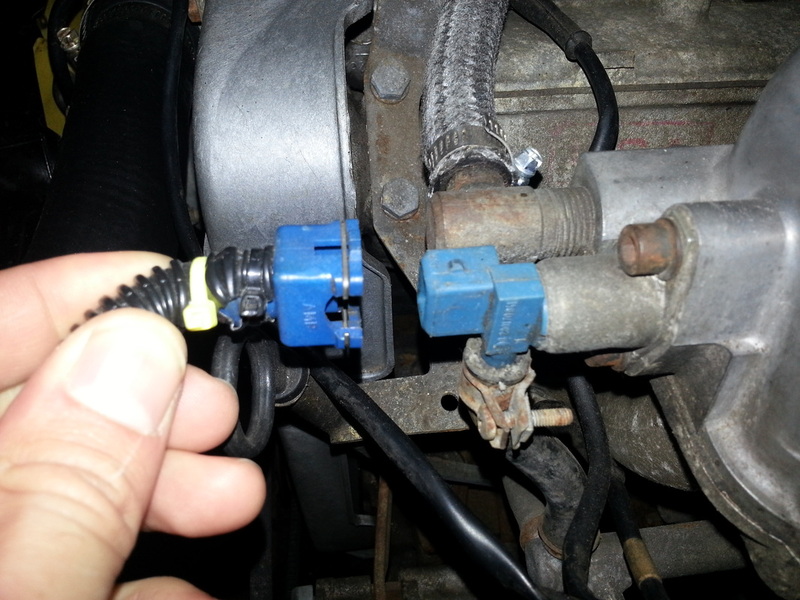 My method is to warm up the car and then unplug the cold start. That way, if I stall while the engine is warm it will start up again. I learned the hard way that if the car is warm and my cold start is firing, the engine floods and I can't drive the car. This solves the problem. As I cleaned up the garage with the car running (and the doors open of course) I heard a loud BANG and was hit by little pieces of plastic and the car shut down. When I looked at the engine I saw that my distributor had exploded!! 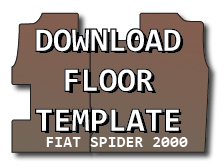 Someone on www.fiatspider.com was kind enough to ship me a distributor, but it was the wrong size. A few short days later my parents kindly purchased me a new distributor and rotor and she was back on the road. Make sure you keep an eye on your rotor mounting screws! 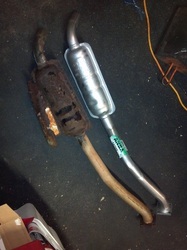 My second section of exhaust had rotted out. The resonator bottom fell apart and every time I started up the car another piece would fall off! 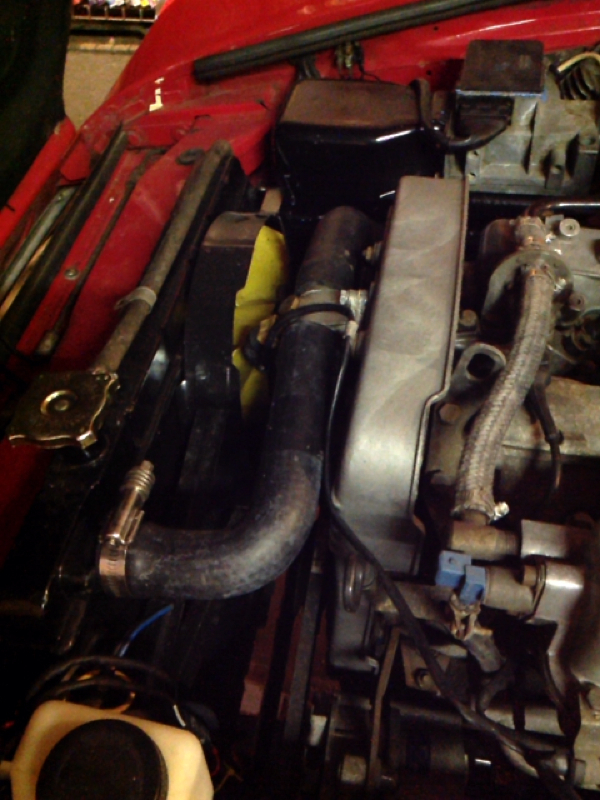 My options were to cut out the section and add in some straight pipe or buy a new bolt in unit. While the cost differed greatly, I decided I didn't want to spend an entire day fiddling with metal work. So I placed an order with Auto Racambi. I had been spraying PB Blast all over the bolts on the exhaust and other random places just in case I needed to remove parts. It helped greatly. I decided the removing the section before the part came was best. That way I could immediately put in the new section upon arrival. I started by removing the bolts to the C clamp. That came off easy. If it hadn't I would have just used a cut off wheel. Next up were the four bolts attaching the catalytic converter. The two bottom bolts came off like a charm. Fiat had installed clips to hold the bolt while you turn the nut. It's a great concept unless the tabs are old and don't hold the bolt. There's little room for tools on that side, so the last two bolts were easily cut away with a cutoff wheel attached to an angle grinder. The only thing left to do was to wiggle the section back and forth until it came free of the muffler. Auto Racambi was FAST with the delivery. It went in easy in reverse order. I used four stainless bolts to fasten the section. 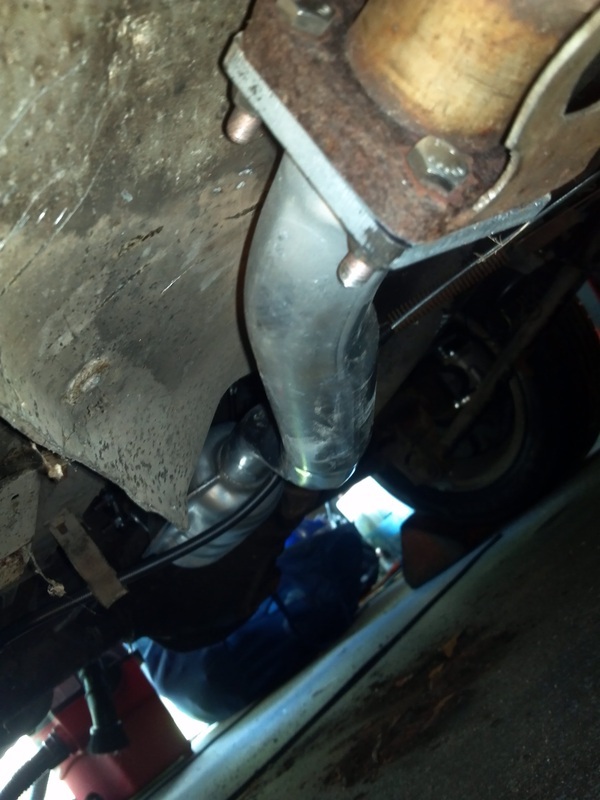 The hardest part was wiggling the new section into the muffler pipe. I don't think this project even took two hours and it was much easier than trying to tack in new pipe and welding.